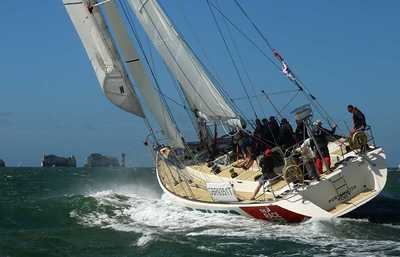 Clipper Races have agreed an amazing rate with Mike our new CI, for a club weekend charter aboard one of their ver 2.0 68 Ft Round the World race yachts. We are basically being offered a 50% discount on a standard corporate charter. The cost of the weekend will be £400, all in apart from a meal ashore on the Sat Night. We will meet in Gosport on Fri evening, parking available or there are rail/ferry links from London Waterloo. After Breakfast early on Sat AM - we will slip Gosport, proceed into the Solent and run through a series of training and race drills. The boat will moor at Cowes on Sat evening, and the crew will eat together at a Cowes eatery TBC, moderate consumption of alcoholic beverages may be encouraged before and after. The boat will slip Cowes on Sun AM and will return to Gosport for Sun afternoon. The crew will run through a very compressed version of the Clipper Week One training, managing the racing sails, learning to steer, steer and gybe the boat. The trip is appropriate to all levels - learning to use a winch and tack a 68' boat develops skills that are applicable at all levels of sailing - the experience is completely different to any other type of sailing. Tacking the boat takes 7-8 people, folding the main is a whole crew evolution - so the weekend is great for team work and communication skills. Clipper training has a big safety focus - which of course will be adopted throughout the weekend, and the advice and principals are transferable to all yachts. Please sign up below to secure your place. A deposit of £200 will now be due. The balance to be paid no later than 1 August.